Loughbrough Students' Table Tennis Club has four teams competing in BUCS (3 Mens and 1 Womens). We have 3 membership schemes, AU Performance, AU Academy and AU Development. Each membership offers a different level of play! AU Performance | This is aimed at experienced players who are looking to play in BUCS. Set training programme and coaching as a minimum. AU Academy | This is for intermediate players who are inbetween performance standard and development standard. Set training periods. AU Development | This is for the beginners/inexperienced players looking to try out or get back into the sport focusing solely on your development. So whether you're a professional player or someone who has never even picked up a Table Tennis bat, we have a membership that will suit you to help develop your game! 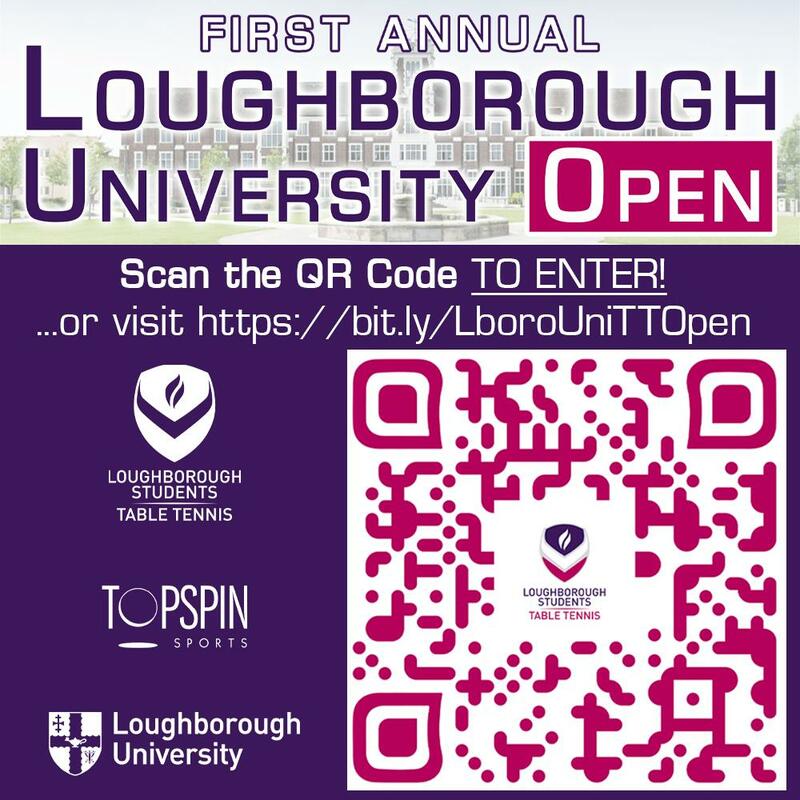 We compete in BUCS, Loughborough League and the in house, UniLeague. Our Taster sessions are the perfect chance for you to try out and see for yourself what the sport of Table Tennis is like. The aim of Tasters is to give you a chance to have some game time on the table and see whether you'd like to join our club! We are a proud club here and want to help make sure you get the full experience so whether you have never picked up a bat and want to give Table Tennis a go or just want to play the sport casually this is the perfect sessions for you to see if you'd like to join! Here you will also find more information about the club and memberships. Sessions are September 30th :12:00 to 17:00 and October 1st : 17:00 to 21:00 both days. 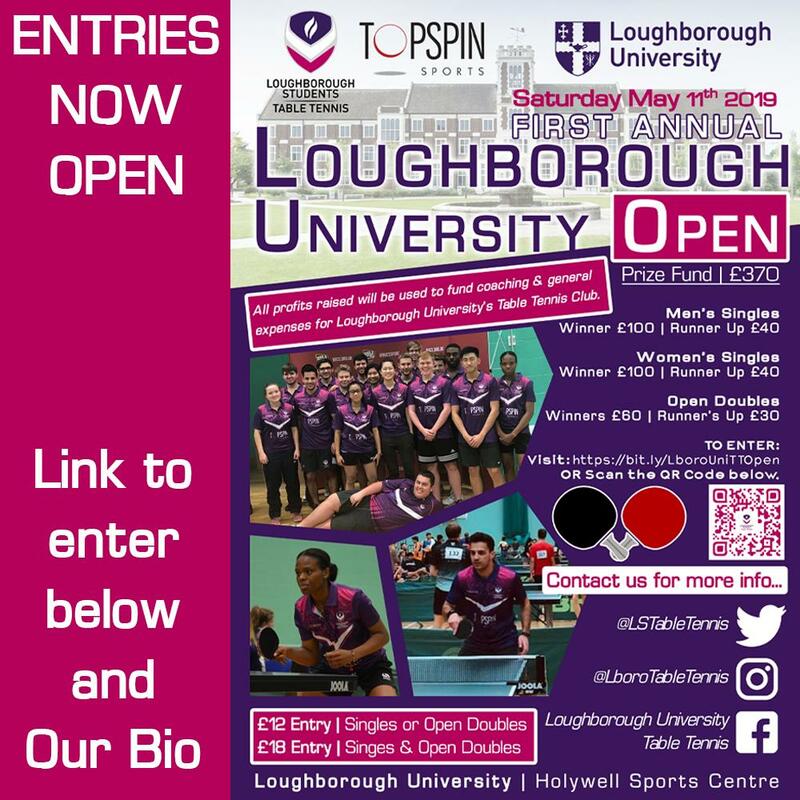 Email one of the Co-Development Chairs, Aryaman or Matt on A.Dasgupta-17@student.lboro.ac.uk or M.Crisp-17@student.lboro.ac.uk to find out any more information or just pop on down and see our stall at the Sports Bazaar on the 29th September! We look forward to seeing you there! Trials are the club's way of assessing experienced players to see what level they will suit and which BUCS and League Team they will fit into. If you are an experienced player, you should definetely be here to trail! Trial sessions work by having a quick warm up and then some games with other trialists and current club members to help the Club Captain's and Chair get a scope for the level of each player. This year, we are having an initial trial and then having a call back/2nd trial for those more advanced to help with the sorting process. Trials are being held on October 3rd from 12:00 - 19:00 and the call backs are being held on October 5th from 17:00-20:00. All trials are being held in the Edward Herbert Building. Email Lois, the club's chair, on L.Peake-15@student.lboro.ac.uk or Jacques, the Men's Captain, on J.Vander-17@student.lboro.ac.uk or Annabel, the Women's Captain, A.Cox-17@student.lboro.ac.uk to find out more. Alternatively, you can pop on down and see us at the Sports Bazaar on 29th September. All Training/coaching sessions for AU Performace and AU Academy are compulsory. Any players who consistantly miss coaching or training sessions will be disciplined accordingly. 3 out of 4 weeks of the month will be dedicated to training for each membership. Once a month, a standalone tournament will be held combing all memberships together. Please note! On Sundays, training is not compulsory for any level of membership, however it is heavily advised that you go and train. AU Performance will receive around 100 hours of coaching throughout the year from an England International Player. They will also have around 30 hours of coaching throughout the year with a Level 3 Coach. ALL coaching for AU Performance players is compulsory and must be attended - yes that includes the 7am sessions on mondays and fridays. Part of the commitment too AU Performance is that you must coach AU Development Players on a rota basis and you must attend ALL BUCS and Loughborough League Matches that you are sceduled for. AU Academy players will receive around 70 hours of coaching throughout the year, 30 of which will be with a level 2 coach. ALL coaching sessions are compulsory and must be attended. Part of the commitment is that you must attend ALL Loughborough League Matches that you are sceduled for - Plus if you are heavily impressing during training and coaching sessions then you have the chance to step up into AU Performance! AU Development have around 60 hours worth of coaching throughout the year. These sessions will be conducted with 30 hours coming from AU Performance players and the other 30 hours coming from a Level 1 Coach. The main objective of AU Development is to evolve your game and well...develop! No coaching or training is complusory however, it is heavily advised you go to these sessions to help develop your game play - plus the more effort you put in, the more likely you are to move up into AU Academy or even AU Performance. However, UniLeague Matches are Compulsory.